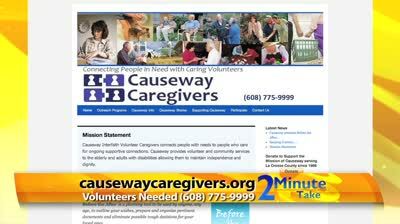 Caregiver Form | Causeway Interfaith Volunteer Caregivers, Inc.
Use the "tab" key to navigate between fields. Pressing "enter" or "return" submits the form. Must abstain while Mentor is present. Causeway Caregivers performs a background check under the direction of The Aging and Disability Resource Center of La Crosse County on all mentors, caregivers and care recipients to determine eligibility. Please provide any information about yourself that will help in finding a lasting mentor match. Do you routinely leave the area for an extended time at a particular time each year? The Peer Caregiver Support Program connects Volun-Peer Mentors with caregivers of individuals diagnosed with Dementia for caring support, socialization and knowledge of local resources. Click to Be a Donor! Causeway Interfaith Volunteer Caregivers, Inc.
Causeway Interfaith Volunteers, Inc. is a 501(c)(3) non profit organization. Donations are tax deductible for federal income tax purposes as charitable contributions.